There was a “One Nation Working Together” rally Saturday on the Mall, and I absolutely wanted nothing to do with it. I avoid dense crowds and large gatherings of people at all costs. I had no idea what I wanted to do yesterday when I woke up. I just knew I wanted to stay as far away from the Mall as possible. I ended up at Arlington National Cemetery. I got there late in the afternoon, so I didn’t get to see much. I did get to see Kennedy’s gravesite and the Tomb of the Unknowns. The ceremony of the Honor Guard was the most elaborate thing I’ve ever seen. I’m not one to stand on ceremony. I try to stay barefoot as much as possible and just do things without much fanfare. The Changing of the Guard was about a 15-minute ceremony where the guard on duty is replaced by a new one. The relief commander comes out to announce to the crowd that the ceremony is about to begin and requests everyone stand. Then, he does a white glove inspection of the new sentinel’s weapon. After the inspection, the two guards and the relief commander meet in front of the tomb, salute and then pass orders from one guard to another. I was more impressed by what the soldiers have to do to become one of the guardians of the tomb. 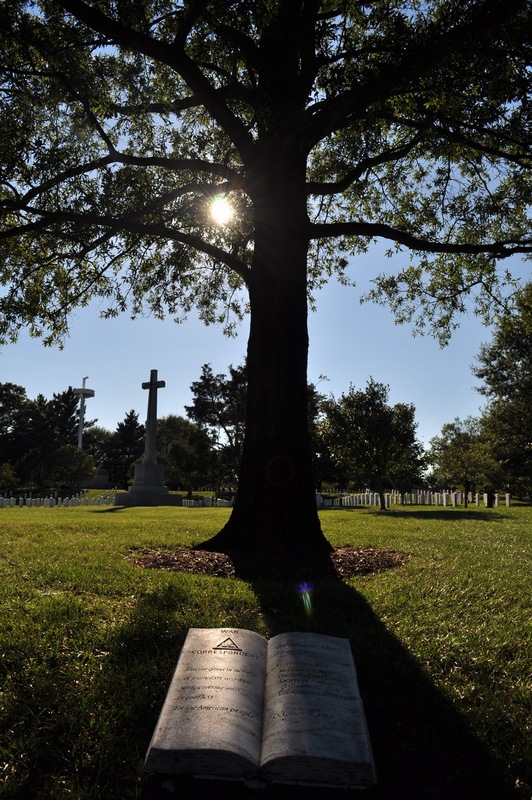 In addition to conforming to height and body build requirements, the soldiers memorize pages of facts about Arlington Cemetery — and that’s just the first part of the process. After being admitted, they begin learning the ceremony and 300 facts about Arlington Cemetery and the Tomb of the Unknowns. Once they pass a test of 100 randomly selected questions out of the 300 facts they learned, guards are awarded a Tomb Guard Badge. The first badge is temporary, and they get an official, silver badge after spending nine months guarding the tomb. I found my favorite part of the cemetery after leaving the Changing of the Guard ceremony. It was a memorial for journalists who died covering the wars. Note the hem of his pants. The handicapped entrance was full of veterans who came to watch the changing of the guard. Left: Relief Commander. Right: Sentinel going on patrol. Want to be an adventurer? Join me in my travels! Subscribe and live vicariously through your email.